One tends to coast in the second half of senior year of high school. Most of the hard work is behind, so just stay cool, graduate and get on in life. The truth is, he really had thought about the priesthood, but that was while he was in seventh grade in public school and eighth grade at St. Patrick School, Norristown. “I was involved in C.Y.O. through the parish, I played sports and was an altar server,” he recalls. Father Frank Hallman, the pastor, and the associate pastors all impressed him, “because of the way they lived, the way they interacted with one another and their willingness to serve,” Father Redcay said. All of these memories came back during that last year of high school and he entered St. Charles Borromeo Seminary the following fall. If it were not for that single question would he have done so? Probably yes, he concedes, because he firmly believes God intended him to be a priest. It would have been by a different path and certainly not that soon. On the plus side there was the camaraderie and the fellowship of the seminary, no matter what year one was in, forming friendships that would last a lifetime. At St. Charles, “it is easy to feel a sense of peace and joy, being part of something that is bigger than you,” Father Redcay said. During his sixth year at the seminary he experienced an uncertainty, and unsettledness. Was this really where he belonged? He couldn’t get a clear answer in his mind, so he took a leave of absence to sort things out. The next year he taught eighth grade at St. Francis of Assisi School in Norristown, not far from his home. It was a wonderful experience, and yes, the respite clarified his desire to continue priestly formation. “I don’t regret taking that year off at all,” he said. He returned to the seminary and was ordained by Archbishop Anthony Bevilacqua at the Cathedral Basilica of SS. Peter and Paul on May 20, 1989. His first assignment was as parochial vicar at Holy Innocents Parish, Philadelphia. He was at Holy Innocents just two years when the Clergy Office must have noticed that bit of teaching experience on his resume, and he was assigned to Roman Catholic High School where he taught religion to freshmen and juniors. He really liked teaching, especially teens, who are generally not considered the easiest age to manage. 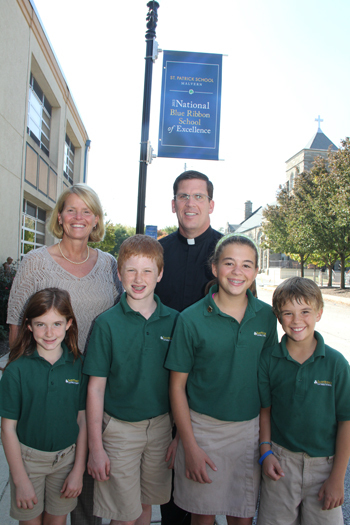 After three years at Roman, Father Redcay was sent to Archbishop Carroll High School in Radnor, where he served as school minister for six years while continuing to teach two religion classes. His next stop was Archbishop Wood High School in Warminster as assistant principal, overseeing activities, which covered everything from athletics to dances. Apparently this was just to get his feet wet on the administrative side of education, because the following year, 2001, he was named president of Kennedy-Kenrick High School in Norristown, which was the successor to his alma mater Bishop Kenrick High. 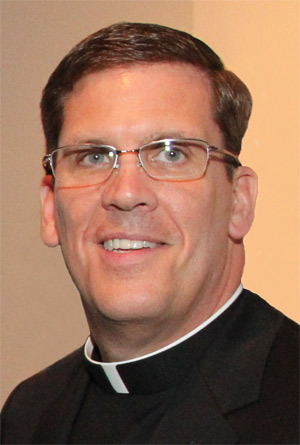 In 2007 Father Redcay was taken out of education and named pastor of Our Lady of Ransom Parish in Northeast Philadelphia and in 2011 given his present duties as pastor of St. Patrick in Malvern, a large and still growing parish in booming Chester County. In certain ways his years in high school ministry, especially as school president, were good training because a fair part of a pastor’s tasks is administration. There are certain differences between the two ministries, he finds. First of all, schools have a September to June cycle, parishes are year-round. In high schools you see students for a very short period of their lives and then they move on to college or some other endeavor. In parishes a priest serves people at every stage of life. After 25 years Father Redcay has not lost that sense of joy in the ministry where he knows God has placed him. The challenge is to encourage others, to give kids the nudge he received in high school. Just as priests were present and happy in his parish and high school, he believes it is his task to also be present and share the joy of his vocation. “You need to encourage vocations, let them know, ask the question, ‘is this something you would consider?’ and families need to pray for vocations,” he said. He absolutely believes the best way to encourage vocations to the priesthood is through personal contact. It certainly worked in his vocation. You would be hard-pressed to find a better person, priest, human being. One of the finest people I have ever met. Glad to see he is doing well. Congrats on 25 years! He’s a wonderful priest and a wonderful person!! !